If you haven’t read Part 1, please do so before reading this post for complete details and tasting notes. To quickly summarize, the first and second shots I pulled were off. The first shot was too fast and the second was too slow. This time, the flow and timing were right on point using the same variables, only difference was the grind size. I started by using the 300 and 600 micron sieves and 34.6gm of coffee from the Super Jolly, which is almost two times my usual dose of 17.5gm. I dumped the 34.6gm of coffee into the Kruve and started sitting for approximately 1 minute. The result from the middle tray was approximately 22.5gm, which means between boulders and fines, I lost 12gm. That’s a hair better than last week’s experiments. The shot was neither fast nor slow, very much the same time it takes for my non-sifted shots but the taste was nothing like my usual shots. The shot was absolutely delicious, creamy, sweet, rich and with a tiny little bit of welcomed acidity. I’m not a fan of too much acidity that’s why I stay away from light roast coffees but the acidity here was just a hint and it added to the complexity of the shot. My conclusion here is that the Kruve and its impact on the uniformity of coffee grounds is undeniable but the questions are, will I be okay with sacrificing more than 10gm of coffees every time I pulled a shot? What about the time, do I really want to add more than 15 Minutes (cleaning the Kruve and the mess it makes take time), to my routine and workflow to achieve a better shot? With these questions in mind, I have decided to use the Kruve but only on weekends. On weekends, I have much more time in the morning and I can enjoy the process. On weekdays, not so much. Saturday my wife and I decided to do something different. Lately, we have been spending our weekends cleaning up the house, hosting or visiting friends and family so it was time for a change. One of our favorite towns to visit and walk around is Newtown, PA. The town is located in Bucks County and less than 20 mns away from New Hope, PA (also in Bucks County) and Lambertville, NJ and 35 mns away from Frenchtown, NJ. All 4 towns are quaint and charming and have something for everyone. Plenty of clothing shops, antique shops, bike shops, restaurants, cafes, espresso bars and bike trails. Since my wife and I adore coffee and love biking, all 4 towns offer a great deal of fun for us. As we headed out to Newtown, PA from North Brunswick, NJ, we decided to stop at the Grounds for Sculpture in Hamilton Township, NJ. As outdoor lovers, we enjoyed our visit tremendously. The Grounds for Sculpture is located where the former New Jersey State Fairgrounds used to be and it includes three of its major historic buildings. The Grounds have a gorgeous and diverse collection of Contemporary outdoor sculptures and acres of perfectly manicured landscapes for your strolling enjoyment. The Grounds allowed me to practice another hobby of mine, photography. The pictures below, although taken with so much care and effort, still don’t do the Grounds justice. After we have spent hours checking out the sculptures and admiring the trees, flowers and landscapes, it was already 2.30 pm and it was time for us to head to Newtown, PA and enjoy another stroll on Sycamore and State Streets. We arrived around 3.15 pm and first thing I did was to open the PlugShare app and check to see if there is a car charger in town to charge my Chevrolet Volt. Sure enough, there were 4 chargers on Swamp Road available for free. Luckily Swamp Road was a 5 minutes walk from State Street so we parked and plugged the Volt and headed to The Coffee Room. After we made a right on State Street coming from Washington Avenue, the Coffee Room was right there on our left. For full disclosure, I have been here once before and I enjoyed the coffee and ambience then. 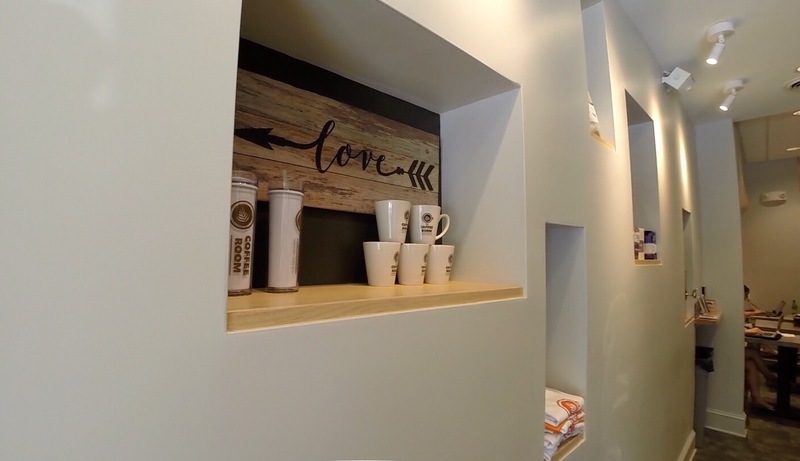 Enter the shop and you are greeted by the coffee bar/counter on the right and a wall with merchandise (t-shirts, mugs and Counter Culture coffee bags) on the left. 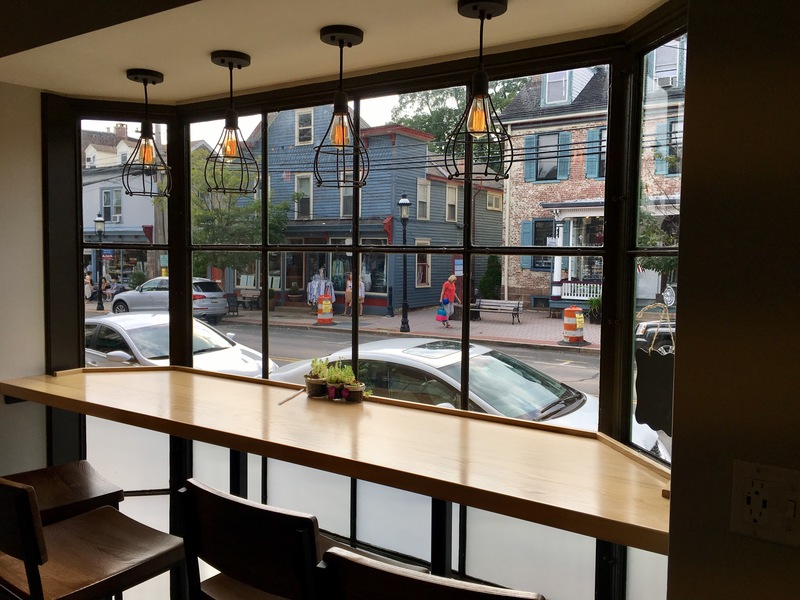 Once you have placed your order and if you would like to stay in the café, you have two seating options either you walk in and sit in the back or you can sit facing a beautiful window overlooking State Street. 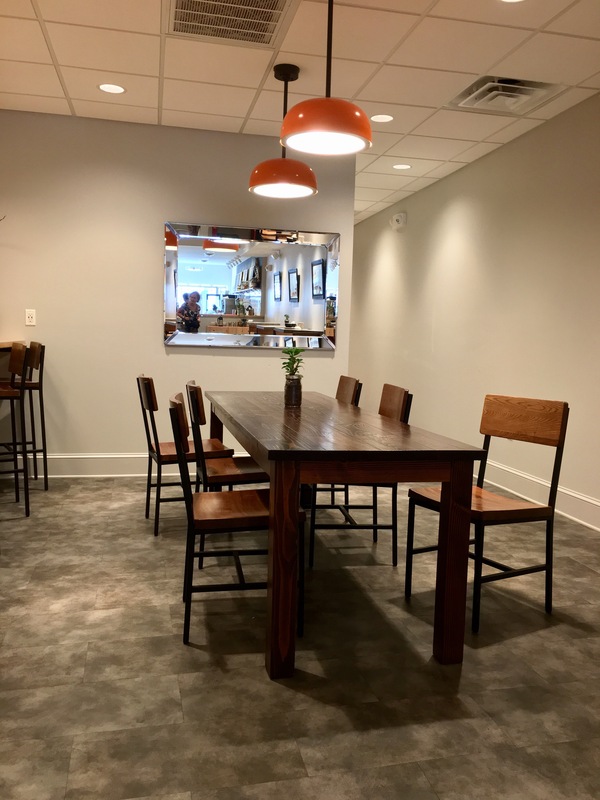 In addition to the beautiful yet simple decor, the place is very well equipped for folks who love to get work done while sipping on their favorite coffees as electric and USB outlets are readily available for charging all your electronic devices. For my order, I asked for a small latte and a chocolate biscotti. The latte was served in an 8 to 10 oz latte cup but no latte art, which struck me as strange for a hip coffee shop serving specialty coffee such as Counter Culture, but nonetheless the latte tasted excellent (latte art is more of a visual treat but its lack thereof can be an indication of improperly steamed milk, not the case here). The excellent beverage taste was courtesy of the barista but also the slew of professional grinders (Mazzer, Mahlkonig EK43 and a Mythos) and of course the espresso machine (LaMarzocco Strada). Every time I visit a café, especially a newer one, I’m simply fascinated by their choice of equipment and the way it’s all laid out for workflow efficiency. 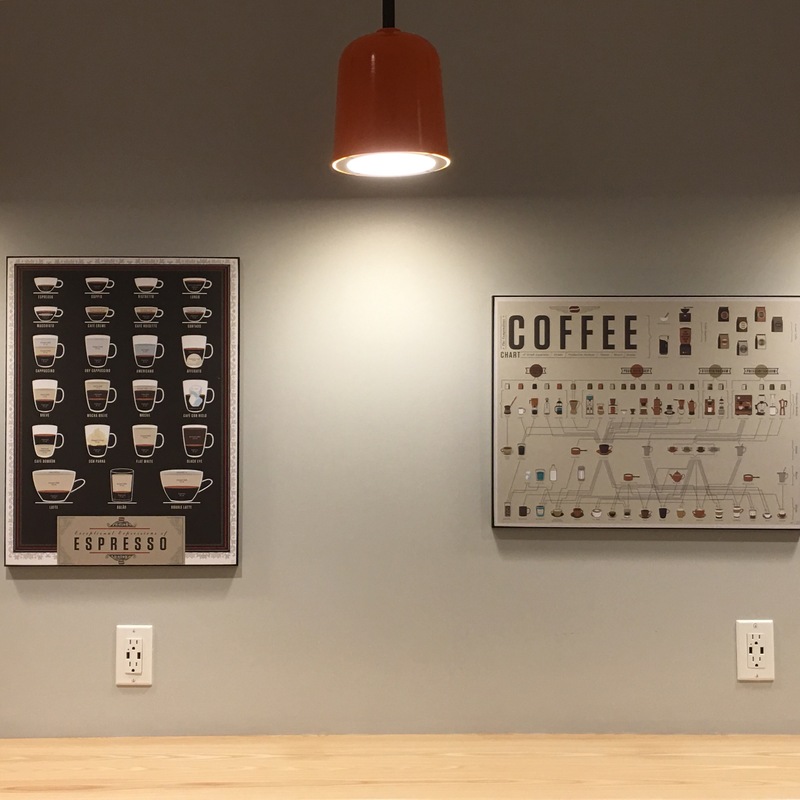 High quality equipment serve as a sign that the café is serious about coffee. Of course the barista plays a critical role but the equipment are the first impression. Overall, I found the location of the café to be convenient, the decor to be comfortable and inviting (warm light helps, LEDs are not cozy) and my latte and biscotti to be delicious. I will definitely come back the next time I’m in Newtown for a stroll or a bike ride. P.S. 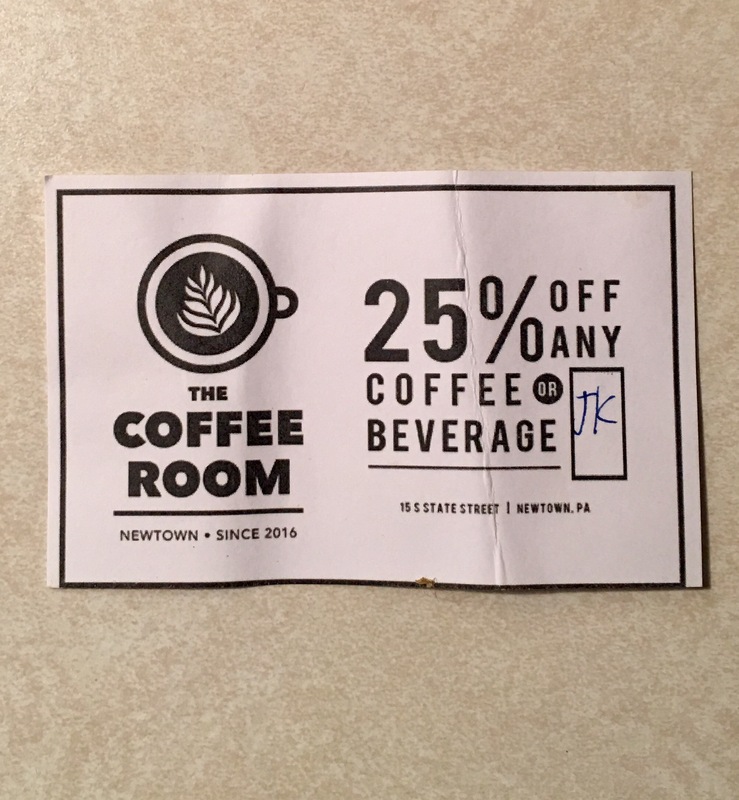 here’s a money saving tip, before you visit The Coffee Room, visit one of the local stores on State Street, you will find discount cards like the one below. Enjoy! My home gear journey started in 2013 when I decided that I want to spend the rest of my life with my girlfriend (now wife) and proposing to her. Once she said yes, the wedding planning began and I realized that saving for the wedding of her dreams will require some sacrifices on my part. At the time, I was working a banking job in New York and as I looked for ways to save money, I realized that in one year I have spent close to $2000 on Starbucks! This sounds crazy but a simple math will show how I got to this number, so follow along. One year has 365 days or 52 weeks. Deducting the paid time off (20 days) and annual official holidays (10 days) leave us with 230 days of working/commuting days. Every day, on average, I had one latte in the morning and one regular coffee in the afternoon. The latte costs around $4.50 and the regular coffee around $2 for a total of $6 per day. Adding $1495 on weekdays + $468 on weekends = $1963! Looking at ways to cut my spending (Junior Analysts salaries are low and the cost of working in the city is high), I decided to stop buying coffee by bringing my own from home. This decision started a snow ball effect! I already had a Cuisinart coffee machine that I thought was okay, at that time, in making regular coffee so I focused my energy on finding an espresso machine I can afford. From talking to my fiancée , I already knew that we will be registering at Bed Bath and Beyond for our wedding registry so I started looking in the store at what espresso machines they had in stock and I came across a Dualit 3 in 1 espresso machine. The machine seemed reasonably priced at around $200 and without any experience or much research, I decided to pick it up and take it home. Since I didn’t have a grinder at the time, I was using preground coffees from Lavazza and Illy and I thought my lattes tasted excellent (little did I know!). Once I had the espresso machine, I needed a table to put it on because our cabinets are very low and my wife (we were living together at the time) wanted the small counter space we have for cooking and making smoothies, etc. I started looking at Craigslist for used table that I can use as an espresso station and it was my lucky day! I found someone selling a butcher block table, that they have customized to include a knock box for their Rancilio Silvia. His reason for selling was that he can no longer drink coffee for health reasons. This gentleman gave me one of the best deals I have ever made. He sold me the butcher block table ($300) with the built-in knock box ($70), an Espro calibrated tamper ($80), a Concept Art tamping stand ($70), a tamping mat ($30), espresso and cappuccino cups made by Nuova Point ($100), Cafiza espresso and coffee machine cleaning solution ($20), Grindz grinder cleaning tablets ($30) and bunch of brand new, unopened, Monin syrups ($100)! All of this for $200 (approximately $750 in retail value)! Ecstatic, I took the stuff home and officially had the first iteration of my espresso and coffee stations setup. As I dove deep into the coffee and espresso world, I realized that pre-ground coffees are not the best and a burr coffee grinder is the way to go to grind the coffee beans on demand. This led me to purchase my first grinder, a Compak K3 Touch. Further research revealed that my espresso machine was using pressurized baskets, a no-no for espresso enthusiasts. Pressurized baskets are used on low-end machines with low end pumps to help build enough pressure to extract the shot. A pressurized basket usually have an internal screen that filters the coffee into a small reservoir and has a single hole in the bottom where the shot is released from. Pressurized baskets are for beginners as they can be used with pre-ground coffees and don’t require attention to ground distribution, tamping pressure, coffee ground size, etc. Looking to improve my espresso quality shots further, I decided it’s time to jump into a Rancilio Silvia to replace the Dualit. In the meantime, I worked on upping my auto and manual drip coffee game so I upgraded my Cuisinart and replaced it with a Behmor Brazen Plus, one of the few SCAA (SCA now) certified auto drip coffee machines. 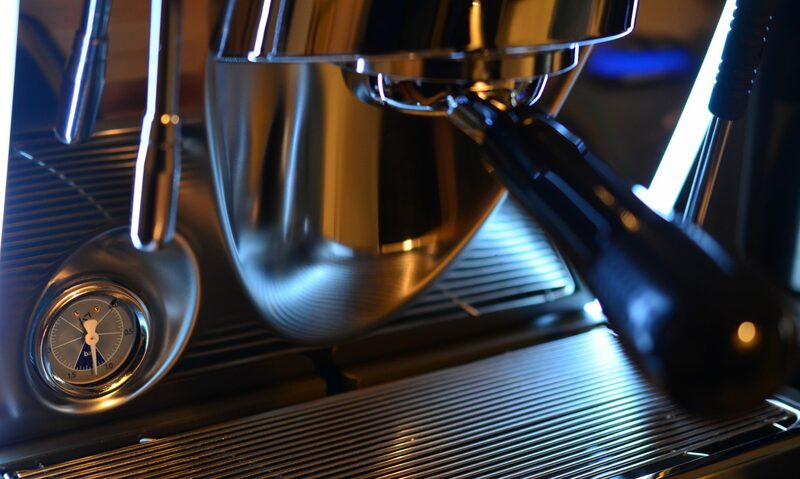 The certification means that the machine is capable of brewing coffee using water heated within the recommended SCA range of 195 to 205 degrees. I also added a Chemex, a gooseneck kettle from Bonavita and a scale (also from Bonavita). Although I loved the Compak K3, I hated the clumping. Also, further research revealed that I’m still missing out on taste and my espresso can become even better if I upgrade my grinder. This is when I decided to go with a Mazzer Super Jolly Electronic Doserless. Not wanting to spend $1200 on a brand new one, I decided to start looking for a used one but being the picky person I’m I couldn’t settle with one that’s not like new with no cosmetic damage whatsoever. I finally found one for sale in Brooklyn, NY that was less than 1-year-old with less than 500 shots on the counter. The seller promised the grinder is in excellent condition and was asking for $900. I brought it down to $750 and drove to pick it up. The grinder looked brand new, no scratches or dings anywhere and worked flawlessly. My quest for better espresso did not stop there, I added a PID to the Silvia to improve shot consistency but still, since I drink mostly lattes and cappuccinos, a single boiler machine like the Silvia where I need to switch back and forth between brewing and steaming was started to become a pain in the neck. This led me to look for a heat exchanger machine so I can brew and steam at the same time. Since most of my drinks are mostly milk based, I started looking for the best steamer in town using a 110V (I’m renting and have no access to 220V/240V for the foreseeable future). With that in mind, I landed on the Nuova Simonelli Musica! The Musica, at $2500 brand new is a no go for me but used, they looked like they depreciate quite rapidly. Lurking on eBay, I finally found one for less than $1000! (eBay had a deal going on and offered 10% of the purchase back in eBay bucks, which made the deal even sweeter). This is the tank model with LED lighting, exactly what I was looking for. The machine was described as in pristine condition, which upon receipt of the machine and inspection, turned out to be inaccurate but I’ll leave this for another post. I also added a dedicated drip coffee grinder (a Breville Smart Grinder Pro) since it’s a pain to switch the Super Jolly back and forth between espresso and drip coffee grind. The setup, now with the Musica, is pretty much how it stands today. While in the process, of upgrading grinders and espresso machines, I kept adding accessories and other brewing vessels such as a V60, milk pitchers, coffee storage canisters, etc. In future posts, I will be reviewing and writing about each of my equipments but if you can’t wait, I already have videos on my channel (https://www.youtube.com/user/hazzi15/videos). Enjoy! As you can probably tell, this is my first post and so I thought I would talk a little bit on who I am and how I started my coffee addiction journey. My name is Gabriel Hazzi and I’m coffee addict born in Alexandria, Egypt. When I turned 18 my family and I moved to the United States and I currently live in New Jersey. I have a full-time job with a well-known money manager and insurance company. I’m also a part-time consultant/contractor for a coffee catering company also based in New Jersey and I’m grateful to have both jobs where I’m able to make a decent living while also work with coffee, which is something I’m passionate about. Since I reached my coffee drinking age (if such a thing exist), I always loved the time I had coffee in the morning and in the afternoon (around 5 pm) with my family. It was always an excellent bonding time, a time to catch up, talk about our plans for the day and how our day went. It was a comfort time. Back then, I didn’t think about coffee as a beverage, instead I thought about coffee as moments. Today, I love the beverage and the moments it brings. I only got fully submerged into the coffee world less than 3 years ago when I was at a friend’s house and he was showing me around his new house and telling me about the scotch and cigars he collects and also the coffees he buys from different parts of the world. As a coffee lover, I was intrigued by this part of the conversation and he went on and explained (not in too much details) how coffee can taste different from one region to another, from one altitude to another and even from one farm to another. At this point, he proceeded to brew me some Costa Rican coffee made by a company called Café Britt. If you are not familiar with Café Britt, it is a company that was founded back in 1985 and based in Costa Rica. They make excellent coffees and chocolates and really served as my introduction to “gourmet” coffee instead of the common Starbucks and Dunkin Donuts coffees that I was previously consuming. Once I tried Britt coffee at my friend’s house, I was pretty much hooked. I discovered that Britt is sold on Amazon and so I went ahead and ordered bunch of them, different coffees, different roasts, etc. This marked the beginning of my coffee addiction/journey. In the next post, I will share my humble and initial coffee gear and what I have today. Stay tuned!